The LoFerno fire pit is the latest thing in patio fire pits. Its patent-pending fire tower design provides more warmth from the same amount of wood and an exciting visual display of flame dancing through the decorative openings. 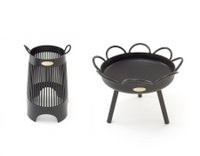 The fire tower section sits freely inside the fire bowl and can be easily removed with the handles at the top. The patented fire tower section of the LoFerno fire pit is designed to hold wood upright, which makes for a cleaner burn and helps radiate more heat. Since the critical mass of the fire is held above the rim of the fire bowl you and your friends can enjoy its full warmth and excitement. Circular openings in the bottom of the fire tower make it easy to start a fire with only a little bit of paper or straw and minimal kindling. Fuel is easily fed in through the top of the fire tower. No need to fiddle with hot doors. The fire bowl and fire tower sections of your LoFerno fire pit are fabricated from 1/4 inch solid steel plate for maximum durability. The handles on the fire tower and fire bowl are 3/8 and 5/8 inch solid steel bar for strength. The legs are 1/4 inch steel tube for stability. Your LoFerno will develop a beautiful rustic patina with use and stand up to all of the elements you can throw at it. While the paint may eventually burn off, unless you are always right by the ocean, rust will not compromise the strength or integrity of the steel for generations. We would claim these will last 100 years easily, but our lawyers say we shouldn’t. 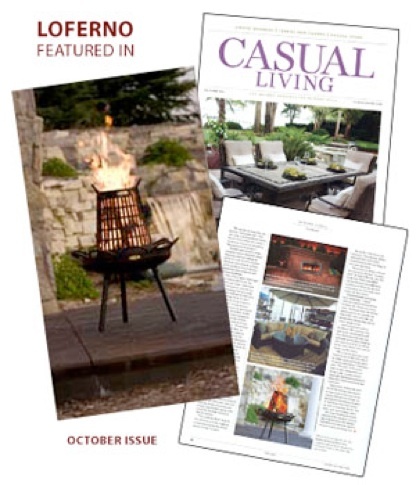 Your LoFerno fire pit will give you many decades of warmth and enjoyment. The LoFerno was designed and is built by Jeff Lohaus, a Northeast Minneapolis visual artist.